Championship week is in full swing at the Tennis Recruiting Network, and my recap of Patrick Kypson's remarkable 16s title in Kalamazoo is available today. My wrap-up of the memorable 18s tournament will come out Friday afternoon. Three of the Kalamazoo 18s quarterfinalists have reached the same stage at this week's $15,000 Futures tournament in Champaign, Illinois. Wild card Reilly Opelka defeated Aleksandar Vukic of Australia, a rising sophomore for the University of Illinois, 6-3, 7-6(6) in today's second round. Tommy Paul, the No. 6 seed, defeated Evan King(Michigan) 6-4, 6-1 and Alex Rybakov, who Paul beat in the Kalamazoo quarterfinals a week ago, upset No. 2 seed and former Virginia star Sanam Singh of India 6-3, 7-5. Opelka's quarterfinal opponent is lucky loser Justin Shane(Virginia), while Paul faces No. 4 seed Kevin King(Georgia Tech) and Rybakov takes on unseeded Richard Gabb of Great Britain. No. 4 seeds Evan and Kevin King (no relation) will play brothers Justin and Ryan Shane in the doubles final on Friday. Vicky Duval won her second match at the Landisville $25,000 Pro Circuit tournament, but then withdrew with an injury from doubles, so her status going forward is uncertain. Qualifiers Robin Anderson, the ITA Player of the Year, and 17-year-old Nicole Frenkel have advanced to the quarterfinals, where they'll play fellow Americans Alexandra Mueller and No. 2 seed Shelby Rogers. In Aptos, the two Americans into the quarterfinals at the $100,000 Challenger are No. 4 seed Bjorn Fratangelo and No. 7 seed Austin Krajicek, who are the only two players still in the running for the US Open wild card given in the USTA Challenge. Krajicek would have to win the tournament to pass Fratangelo. The Cincinnati ATP Masters and WTA Premier event has announced its wild cards, with Kalamazoo 18s champion Frances Tiafoe and Kalamazoo 18s finalist Stefan Kozlov receiving qualifying wild cards. 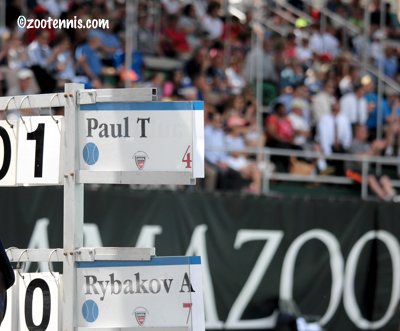 Main draw men's wild cards were given to Mardy Fish, Fratangelo, Jared Donaldson and Rajeev Ram. Daniela Hantuchova of Slovakia, CoCo Vandeweghe and Allison Riske received the women's wild cards. In addition to Tiafoe and Kozlov, Ryan Harrison, Vicky Duval, Taylor Townsend, Sachia Vickery, Alexa Glatch, Louisa Chirico and Nicole Gibbs received qualifying wild cards. One more men's qualifying wild card is to be announced. The NCAA announced today that the format used in the ITA National Team Indoor Tournaments in February will be adopted for the 2016 NCAA Championships in Tulsa. This is a six-game no-ad set for three doubles matches, and best-of-three tiebreak sets with no-ad scoring for six singles match singles. The individual championships will also be played best of three with no-ad scoring, and in lieu of a third set in doubles, a match tiebreaker will be played as is done on the ATP and WTA tours. As I detailed several times in the past year, I will not be providing any on-site coverage of these events due to my dislike of the no-ad tennis format, but I will continue to follow tournament results from home and write about the college game and players. The men's and women's Division III NCAA championships are in Kalamazoo in 2016, so I will be providing on-site coverage of that event. At 4-4 in the 5th set, no-ad scoring would have enabled Kozlov to hold instead of Tiafoe breaking. Would Tiafoe still have gone on to victory? Also at 4-4 in the 3rd, with Kozlov serving, I believe no-ad would have allowed Tiafoe to break and likely serve out a routine 3 set victory. Not positive, but I know Kozlov saved a few break points at 4-4 in the 3rd. Interesting that both Stevie J and Kudla did not receive Cincy WCs or did they decline them. Recently, Stevie reached the semi of a 500 and is ranked in the top 50. Kudla reaches the final of a 250 and is ranked well within the top 100.